Unexpectedly discovering something precious among the mundane must be one of life’s universal joys. It can happen anywhere – wandering into an unknown restaurant and being served a delicious meal without once checking Yelp, randomly popping into a thrift store to find a complete mint set of Captain Carrot and his Amazing Zoo Crew comics, or, even more rare, strolling into your friendly local game store and buying a mystery game without once checking BoardGameGeek. The latter is what happened to me one Saturday this January in Atomic Empire. I spied a non-descript box spine that I didn’t recognize, pulled it from the shelf, and looked long and hard at a slightly-generic, bright, mostly-blue illustration of a woman and conductor staring aimlessly out the window of a train as if in some Victorian-era opium haze. For a brief moment it reminded me of when I first pulled Airships from the shelves of that same store six years earlier. I shrugged, muttered “it has to be good” under my breath, and plunked down my $45 for the cashier. I do so love it when I’m right. First Class is designed by Helmut Ohley, and is billed as a spiritual successor to Russian Railroads – Ohley being that game’s designer, as well. 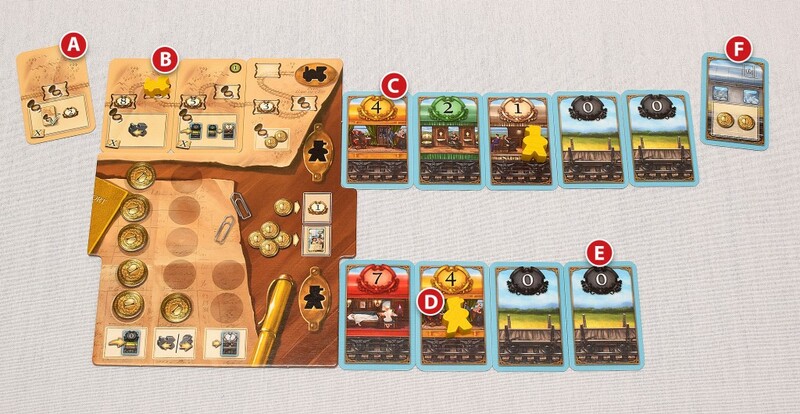 But where Russian Railroads is a bit of a number-crunching, min-maxing, worker placement beast, First Class is, at its heart, a fairly straightforward and slightly breezy card-drafting game. That said, First Class has surprising depth, and, ultimately, far more replayability than its beastly relative. Russian Railroads enthusiasts can direct their wrath toward the comments section below. In First Class, players are competing rail line managers, constantly working to upgrade their trains and improve their routes from Venice to Constantinople along the Orient Express. Players will accomplish this by drafting action cards from a central area over the course of three 2-round stages. These stages each have their own deck of action cards that can be mixed and matched with two of five different modules in the box. We’ll get to the differences in those in a bit. A) Expand Your Route. Each one of these cards drafted is placed to the furthest left of your train route. These cards contain stations that will score you points and give you additional actions during the scoring phase at the end of each of the three stages. B) Move Your Train. Your train begins its route in Venice, at the top of the player board. Action cards (and bonus actions) move your train one or more stations to the left along your route cards. Each station with a pocket watch may be activated in any order for a bonus action during the scoring phase if your train has reached that station. In this instance, the yellow player may move their train once (the bonus symbol on the card where the train sits currently), add a car to their train (we’re getting there), upgrade one 0 train car to a 1, and collect two coins. C) Upgrade Your Train Cars. Each player has two train lines that they can add to and improve during the game. Players begin the game with two 0-value railroad cars. Some action cards improve the values of certain cards. Train cars upgrade in particular value increments, from 0 to 1, 1 to 2, 2 to 4, 4 to 7, and 7 to 12. The basic rule is that no train car may be of a higher value than the car to its left on the line. D) Move Your Conductors. Each player has 2 conductors – one for each of the upper and lower trains. Some action cards/bonus actions may allow players to move one or both conductors one or more spaces to the right along their train cars. During the scoring phase, players score the value of any train cars that contain the conductor, or are to the left of the conductor. In this instance, if this was a scoring phase the yellow player would score seven points for the top train, and 11 points for the bottom train. E) Add To Your Train. Some action cards/bonus actions allow payers to add 0-value cars to their trains. These cars are always added to the right of existing cars on either train. Players also have four mail cars that are automatically added to a train when it gains its fifth car. The player chooses which mail car they would like to add and takes the extra action. In this instance (F), the yellow player would take two coins. There are also contract cards that may be drafted that have a specific condition that must be met during the game. If that condition is met, the player may receive bonus actions, score points, or both. There is also one more train car that may be added to a player’s train – the locomotive tile. The locomotive tile is automatically added to a train once that train has reached nine cars. Depending on the locomotive tile that is added, the player may immediately upgrade one or two train cars of their choice. The locomotive tiles are also worth bonus points during scoring if the conductor has reached them. When a conductor reaches a locomotive tile a player may also be eligible to score extra points from the Constantinople tile if there are spots available. It’s fairly easy to see how using action cards and bonus actions together can create interesting and dynamic combos during the game. There is one more mechanism for pulling off awesome combos – using coins. Coins may be gained during the game through action cards and bonus actions, and are always filled from the leftmost column upward before continuing to the next column. Coins may be spent at any time during your turn, as well as during a scoring phase, to gain an extra action. Coins spent from the leftmost column allows a player to add a 0-value car to their trains. Coins spent from the middle column allow a player to move their train one space along their route, or move a conductor one car. Coins spent from the rightmost column allow players to upgrade one train car of their choice. Players may also spend four coins during their turn to take a Game End card. These cards score bonus points at the end of the game depending on how many of a certain card type were taken during the game. Coins may also be spent at any time for victory points at a 1-to-1 ratio, but I wouldn’t recommend that until the end of the game! So those are the basics – now let’s talk about those modules! As I mentioned, First Class includes five modules, two of which are chosen before each game and shuffled into the three stage decks. The rulebook recommends that Modules A and B be used when teaching a game, and they are the most straightforward. You’ll likely play with these modules quite a bit since you’ll be teaching the game to a lot of people. But don’t worry, there’s still plenty of variability with just the beginning set. Module A: The Contracts. As the name implies, the cards in this module are almost all contracts. You don’t necessarily have to complete any contracts in order to be competitive in First Class, but playing with Module A makes a contract-heavy strategy far more viable. Module B: Celebrities and Postcards. Celebrities are added to a leftmost empty train car when they are drafted, and double the score for that particular car during the scoring phase. Postcards, when drafted, are added to any route card and double that routes bonus action during the scoring phase. Postcards are a tad more versatile as they can be added to any route card to create combos that best suite a player’s strategy, but taking advantage of Celebrities in swanky, high-value train cars early in the game can really make scores soar! Module C: First Class Murder. You can’t have the Orient Express without some murder! In this module, Hercule Poirot boards the train and each player is dealt one Whodunnit card. One of these cards indicates that a player is the murderer, while the other players are innocent. In a 2 or 3-player game, there may not even be a murderer! During the course of the game, players may gain or lose Evidence tokens through action cards. Evidence tokens have a few symbols on the back – 1, 2, or 3 fingerprints which throw suspicion your way at the end of the game, 1, 2, or 3 bonus points, or a discard one Evidence token symbol. At the end of the game, players reveal their Whodunnit cards. The murderer is given two more Evidence tokens from the supply and then all Evidence tokens are revealed. The player (or players, in a tie) with the most fingerprints is arrested and cannot win the game! If the murderer manages to avoid arrest then they gain an additional 20 points. Module C is a fun departure from the usual focus on just scoring, and it can invoke a bit of social play. My only recommendation is not to play this module with two players – it just doesn’t hold up. Module D: Passengers and Luggage. This module introduces – you guessed it – Passengers and Luggage! How thematic. Many of the action cards in this module may be used either as a Passenger (added to the leftmost empty car on the top train) or Luggage (added to the leftmost empty car on the bottom train). Each card has a requirement that must be met before the Passenger is seated or the Luggage is loaded. Passengers will give you additional coins when they are seated, and the more Passengers you have seated before them, the richer you’ll get! Some Passengers may also provide a one-time bonus action. Luggage will provide points when loaded, and will provide bonus points if more Luggage is already loaded on the train. As with Passengers, some Luggage cards will also provide a one-time bonus action. This module is pretty straightforward and can easily be used in teaching games in place of Module B if you want some variety when showing it to new people. Module E: Switches and Mechanics. This module is the most complex of the five. When a Switch or Mechanic card is drafted, that card is placed sideways in the space between the upper and lower trains. Both Switches and Mechanics will affect both your upper and lower trains. Switches will provide bonus scores during the scoring phase if you have met the card’s requirements – typically that the affected car be of a certain value and that the conductor is either on or has passed that car. Mechanics give you a bonus of two coins when drafted. 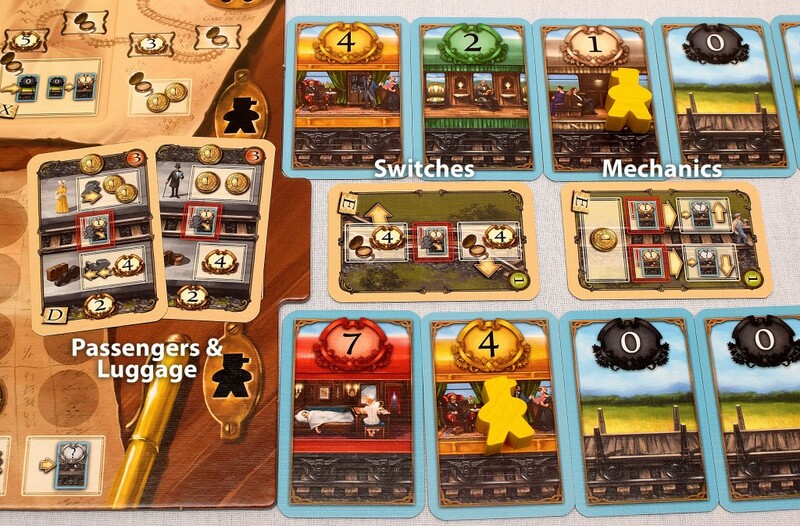 The Mechanic cards are structured similar to contracts; when a particular requirement is met in the leftmost train car, the car next to it may be upgraded. This can be done for both the upper and lower trains once. As you’ve no doubt guessed at this point after all the positivity and the devoted verbosity, I adore First Class. The fact that I had not heard of it before buying is certainly a bonus to the joy it brings; but had it been four months later and I known the adulation and online buzz surrounding this plucky little title now I would be just as happy with my purchase. Everything about this game, from its subtly slick gameplay to its bright, optimistic Euro sensibilities combine to make you feel, well, happy. And that, my dear readers, is one delightful train to be on. 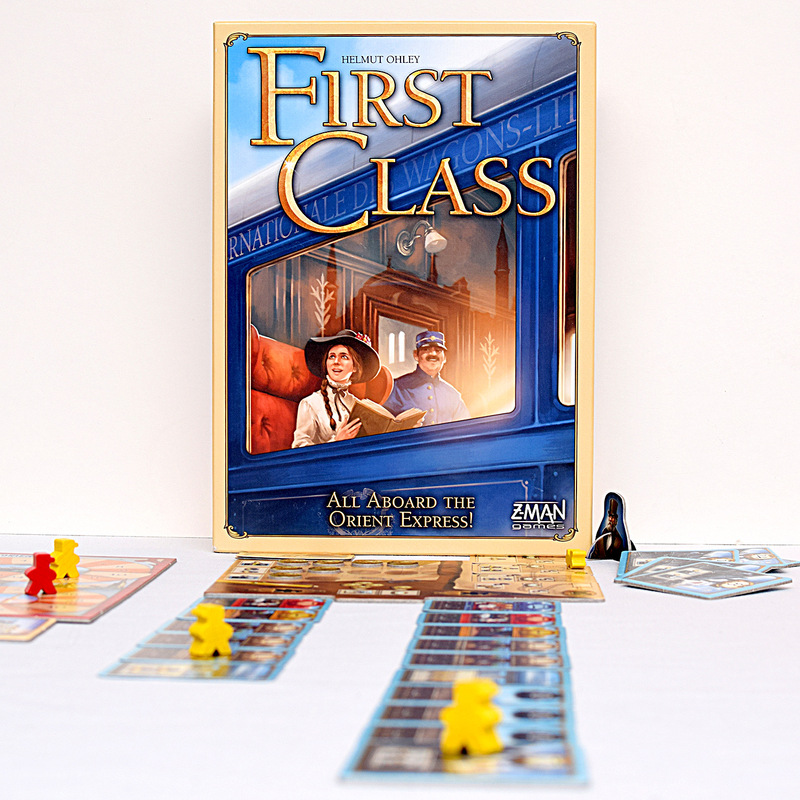 First Class is one of those rare games that is easy to teach to gamers of most any experience level, as well as being satisfying to play by any of those gamer levels. It also happens to even the playing field between said levels; I’ve had players who are sharks at Russian Railroads at the table with beginners and see those pros get their hats handed to them at the end. 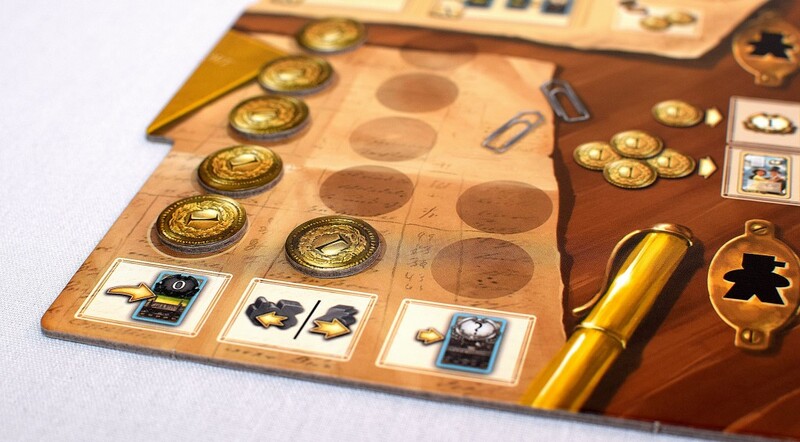 As far as replayability goes, the ability to mix and match modules right out of the box gives the game a lot of life, which is a good thing because it plays quickly and you’ll likely be teaching it to more and more gamers. My only wish is that more modules were available now! There is a Tea Time mini expansion, but it’s very hard to get. I’ll have to get my board game Dieter on it. As I mentioned in the introduction, the artwork for First Class isn’t going to knock the socks off some gamers with more Amerocentric sensibilities despite the talented efforts of one of gaming’s greatest artists, Michael Menzel. It has a fairly generic, but also incredibly pleasant Euro appeal that adds to the inviting, relaxed nature of the game. The graphic design is very well done, and the symbology is easy to interpret, so no cheat sheets are needed. As for the theme, I love that it’s trains and you’re not trying to eke out a buck or two through rail stocks over four or five hours. The artwork and theme combination are what made me trust my gut with the purchase, but there will be a guts and guns enthusiast who may scoff at your offer to teach from time to time. Yes, First Class is incredibly fun. Recently on The State of Games, we took a look at what makes certain designs fun, and one of those definable aspects is when a game makes a player feel smart. First Class opens up intuitive avenues for varied styles of plays and, most importantly, combos that make the most meek gamer feel like a genius. For that, and for its breezy, optimistic atmosphere, First Class is truly a game that will please all ages and all types. Overall score: 17 out of 18 - If you’re not buying your First Class ticket right now, you’re missing out on one helluva ride. First Class is a game for two to four conductors, ages 10 and up, by Helmut Ohley from Z-Man Games. It retails for $42.49 from Miniature Market, or you can pick it up at your friendly local game store. Great game great review. I’ve only played with the Celebrities and Postcards modules. Would love to give the others a try. Love the game, love the review. Can totally tell your passion for the game by the detail you put into it. Congrats on the upcoming 7th anniversary! Really hope to play this someday, looks like lots of fun. Thanks for this great review – added to the top of my wishlist! Such beauty in it’s simplicity. I’ve heard such great things about this one! Great review. For some reason I really love the components of this one. Hope I can snag a copy eventually. I held off importing this months ago but now that it’s becoming available here the US, I’m not sure I can resist any longer. Fantastic review. The in-depth anaylisis, clear and well shot pictures, and overall explanation of what makes this game great in your opinion is really well done. Thanks for the great content! I must say this game hits the combo itch. Everything feels awesome to do and you almost think there is no way the other players can beat me with my sweet setup but then they do. My kind of game yet I don’t own it but do plan on winning it. I played this for the first time at BGG.CON this past weekend and found it just as enjoyable as you described. I can’t wait to play the other modules now. Looks like a really interesting game. May scratch a few of our gaming itches! Ive been dying to get my grubby mitts on this game ever since you talked about it on the podcast! It looks awesome and I cant wait until its back in stock! Gotta love the theme and using its mechanics, wish to play this one! Nice review for a great looking game. Thanks for the excellent review. I love games with card drafting mechanics and am excited to try this game. Fantastic game! My wife and I love playing it 2 player with modules B&D. This is a game I have had my eye on for some time. It looks and sounds fun. But right now my gaming group is at a pause, employment changes, life style changes, and the usual after playing with the same folks for years. The chance to get it free sounds great. As for your review, it is one which will get me to listen to your pod cast, I like the comparisons and enjoyed the comments. I must confess I would read it sooner than listen. But a great review process anyway. Will be watching. I love the different modules! You provided great explanations about each of them. You had me at trains and murder mystery. Really looking forward to trying this! This goes on my wishlist! This was a really thoughtful and fleshed out review, and gave me a good sense of the game as well as where it fits in with other games. 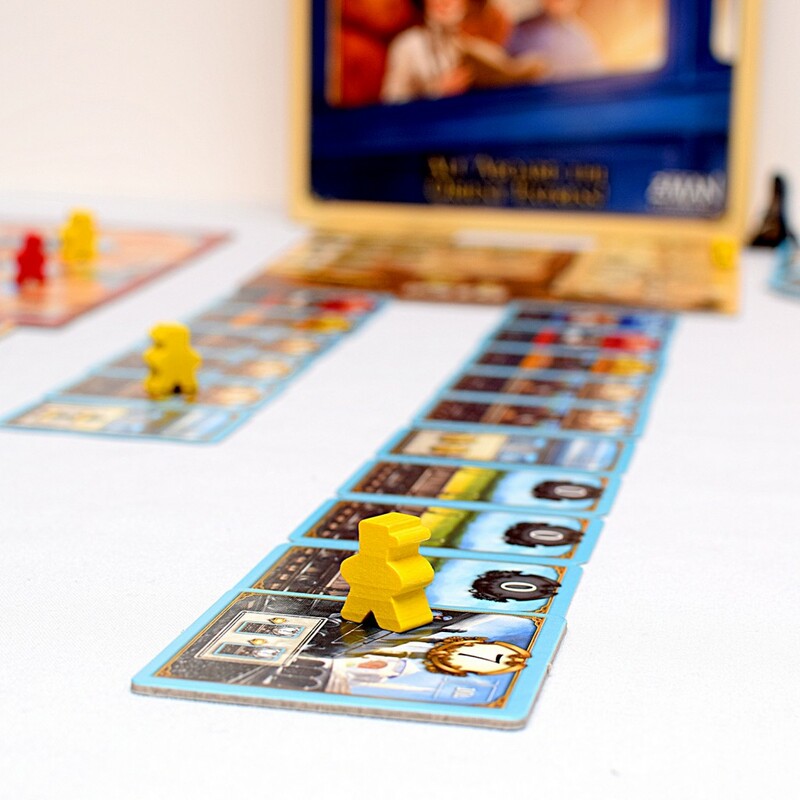 We like drafting games and train games and are eagerly awaiting the new version of Murder on the Orient Express to hit theaters in November, so First Class sounds like it would be a good fit for us. Hadn’t heard of this game before, definitely excited to check it out after this review. I heard about this game a month ago and it sounded interesting, but I had shelved it in the back of my “wishlist”. However after reading this, I think I might move it toward the front. Thanks! I’ve been wanting to play this game ever since you starting posting about it on Twitter. I haven’ played Russian Railroads, yet, but if this is better, maybe I should try it out first. I enjoy Russian Rails but it is easy to get bogged down in the mechanics and lose the theme of the game. This game does sound like an effective alternative. First Class seems like a typically excellently designed then developed game from HiG. I like the bonus of having the modules one can include to change things up. And the idea of having lots of different paths, but not too many, shows how well it was developed. Very interesting. 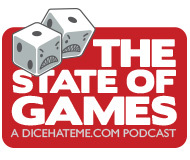 Nice to see an additional review from DIceHateMe. Wow this looks really interesting. Thank you for the great review. Okay, now I really want to play this one — in particular with Module C! Great review! I haven’t played this one yet but keep hearing great things about it so I will have to check it out sometime! I can’t figure out some of the icons. one looks like a clipboard. what does that mean? the art is pretty, but I can’t seem to figure out some of the pictures mean. The instructions tell me that the pictures are easy to understand, but that doesn’t really help. also in 9 turns, how does one build one or more 10 car trains? also, on the scoring rounds, do we re-achieve the pocket watch bonus actions that were already achieved when we passed them the first time? Is there a contract icon cheat sheet somewhere? If you reply by email, that would be great.